You can see the voice recorder on the couch that she's listening to. Our current homemade audiobook playlist includes I Want My Hat Back, How Little Lori Visited Times Square, Swatch and Charley Harper's Animal Alphabet. It's 26 minutes of reading that she can listen to over and over and over again - well past when I would consider reading the story again. My limit is usually 3 times before I start reading poorly - but she can do this 10 times in a row if she wants to (with a well-read, not tired version). Recently, when I asked my friends what their favorite reading material was - I got varied responses. Some answered with their favorite childhood book, others answered with adult classics and others responded with what they loved reading to their own kids. ​And that's because, most people don't like poetry. That includes me. Usually. 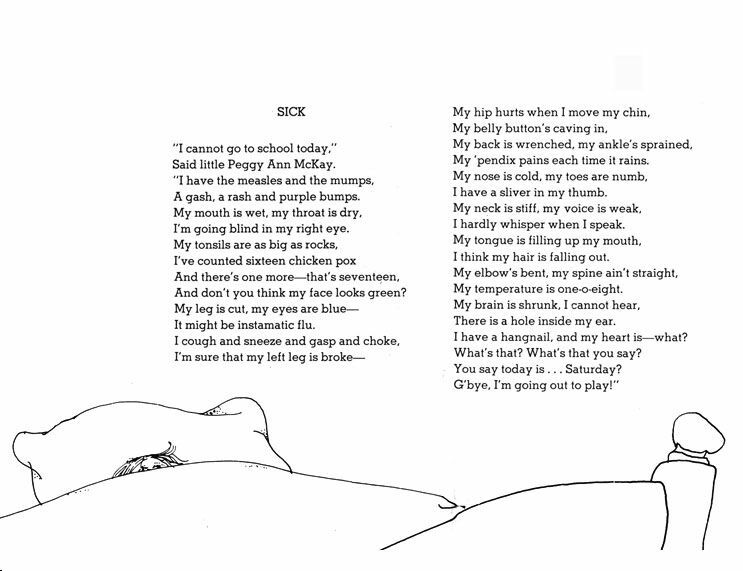 One of my friend's reference to Shel Silverstein brought up a memory from so long ago, it was one of those spontaneous remembrances that I have to share. The rawness, the embarrassment, the difficulty with poetry. In 6th grade, our school had a big musical production. Everyone could try out. I decided, against my better judgment and my own nerves, to give it a go. I chose a Shel Silverstein poem to use and practiced it over and over. And over. And over again. I practiced it in my head. I practiced in front of a mirror. I practiced on the bus. I do remember this, I had my own copy of Where the Sidewalk Ends. I'm not sure why, but I did. And, I still have that copy. It's sitting next to me right now. The spine of the book is so worn from practicing the poem for this audition, that my copy opens right to page 59. To a poem called Sick. I remember being very nervous at the audition, but having a very inviting and trustworthy teacher, Mrs. Von Trebra, at the helm making it okay to try out. In front of everyone. With poetry. The good news is - I made it through the experience. The bad news - I was so nervous, that I'm pretty sure I read with absolutely no fluency. I just read it out of my head. It had no feeling. I focused on one point on the wall and just got it out. ​I felt like I read poetry wrong. I didn't do it justice. And that made me hate it. But, here's the real poetry. I did it. I went on to not star in the 6th grade production. I had a very small role (incidentally, a role that required me to stare blankly ahead while I delivered my lines) and my mom made the flapper dresses for one of the musical numbers. But still, I made myself experience life. Even now, I still remember what it felt like to try out in front of everyone. To feel like I didn't "read it right". And, that's how a lot of people feel about poetry - that they can't read it right, understand it or pick good poetry to begin with. And so, many of us don't read it at all. Not to ourselves and definitely not to our kids. ​Now, fast forward to when I was at Northwestern and taking a class on teaching writing to kids. A big part of the class was doing a lot of our own writing and eventually, we hit upon a poetry unit. Not my favorite. Our professor assigned each of us to bring in poetry from our lives for the next class. The day we were all supposed to bring in our poetry, we went around the room and shared what we brought in. Most people brought in a poem they liked, or a poem that represented their current moment in the universe, or a poem they aspired to in life. Public speaking was not always fun for me and sharing even just in class is a public speaking event. Now, it doesn't bother me. But 10 years ago, it was always an act of making the private me, public. So, I was nervous to share my poetry. It didn't help that I brought in something totally, and completely different than everyone else. I was putting myself on the line in a big way. I had a binder shoved full of paper as my poetry. And that paper had baseball stats on it. Yep. With highlighter marks, to-do lists, circles of important stats. Every year, I was on a fantasy baseball team. And I usually did pretty well at it - or at least, it was something I was very confident in doing in my own real life aside from school and teaching. To become good at fantasy baseball, I managed my team by checking stats, trends and following specific players and their match-ups. I printed it all out, put it in a binder and usually had this binder on my desk. Oftentimes, that binder turned into where I'd write my to-do list, or messages from voicemail or stick a post-it note a student had given me during the teaching day. That binder was my poetry. ​It was the poetry of my life. The idiosyncrasies that I experienced, the observations I made, and the actions that I took. The binder was my rhythm. If writing is one way to express and share observations in life, poetry is just another form of that. You could look through that binder and observe my life happening. Poetry in motion. Living poetry. I'm still not in love with poetry. Sharing that binder made me more confident in myself, and it took awhile before I happened onto poetry that I loved. But, I still don't like all poetry and some of it is still really hard for me to grasp. I remind myself that songs are poetry too. And, I try a new poem or poet every once in awhile. Just to be sure. ​After all, poetry is the rhythm of experiencing life. Be light on your feet! I never delivered it. But I keep the original draft in my desk drawer, to remind myself that not all poetry is bad. It can be a great outlet too. Do I have to? Reading 30 minutes a day to your kid. This will be a series looking into why we read to our kids, best practices for doing it and training in how to do it best at home. ​Ages: 6-11: "Have characters that look like me"
​Ages 12-17: "Have parents who help them find books and encourage reading for fun in specific ways"
​Wait, what? Why not? The pediatrician and teachers told me I had to. One main reason is because it makes reading seem like a chore. It can be much more creative than that. And oftentimes, there are a few instructions missing when teachers, doctors and librarians ask parents to read to their kids for 30 minutes. Your reading for the day doesn't have to include a book. Build trust in reading to build enjoyment. Read some books multiple times and with different emphases. ​When teachers and pediatricians ask parents to read at home, it's because they want kids to be supported in literacy in all places in their lives. Being able to read is so important. It's a life skill. And we all know that. Just reading 30 minutes every day without much training actually shows very mixed results, especially for the younger set. So, what are we to do? There are research-based ways to go about it and the Reading Workshop model is supported by mounds of research. It was first proposed as a reading model in Nancy Atwell's book, In the Middle. I've gone through this book forward and backward while teaching, so you don't need to. There are five components to Reading Workshop and since 1987, when Atwell's book was first published, the research has supported each component. They are uncomplicated - read everyday, have authentic choice options, respond to books, have a community of readers and have routines around reading. I will delve into the areas in more depth in future posts, but the one I want to focus on today is having access to authentic choices in reading. Ideally, teachers would evaluate what each student is interested in by experiencing life with together, listen to the questions the student has and then develop a set of reading texts that would support the student in reading. But, it's just not possible for teachers to do this with all of their students, all of the time. That's where you come in. You can go experience life with your kid. And then building reading from there. Here's an example. My daughter was really interested in doing a butterfly kit last year. So, we did one. I bought a bunch of books ahead of time that showed us how a caterpillar turns into a butterfly. Some had great pictures, some were only pictures, some were way above her reading level but made good read alouds for us, and some were only somewhat related to gardening. When we got the stack of books, guess what happened? She wanted to go outside and find butterflies. Perfect idea. So we did that. And when we got back inside, Liliana looked at me and was obviously disappointed. There were no books about ladybugs! What?! Of course not! We were doing something related to butterflies! We were both frustrated. Had I done an outside garden walk first - had we lived first, I would have known. I would have heard her questions. I could have better tied butterflies into ladybugs and gardens and showed all of them were related to helping gardens grow. Instead, I was scrambling to find books about ladybugs (good or bad). I had made the mistake. ​I tried a cold open to reading and learning. I counted on the subject being interesting enough, with a hook (the butterfly kit) to get her interested, but ignored that she might have tangential interests that were still pertinent. I should have warmed her up. Taken her outside, to the farmer's market, the botanical gardens, a museum, or watched a video and listened to her questions. This is true for bigger kids too. It's always better to base your reading with them on something they have real questions about or a real interest in. It's actually a form of reading comprehension. And, it's good child psychology. Your child is in a zone of proximal development. Your child is ready to learn and understand, with your help. Text to self connections are one of the first ways we teach readers to understand what they are reading. And, it's one that sticks with every good reader. That's why when kids get older, they want to see characters in books that look like them and act like them too. They are making those same text-to-self connections. They are asking questions while they read - is this believable? Would I do this? So, I contend to make your reading successful with your readers at home, you need to warm them up. To foster a love of reading, foster a love of living. Listen to what your child is talking about, what gets them speaking up and speaking fast, what lights their eyes up. Then, base your reading time with them on their interests and their questions. Surround them with authentic reading choices. And yes, experiencing life with them, should absolutely count for your 30 minutes.